What does it cost to water lawn in summer? We all know how watering a lawn inflates the water bill during a drought. Therefore, it is important to take necessary steps to cut your watering bill and summer expenses. 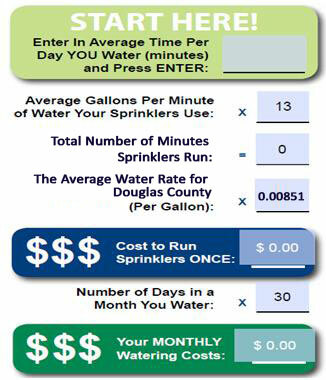 However, to reduce watering cost, first, you need to know what it costs you. That is why, in this blog, we are giving a worksheet to calculate how much it costs you to water your lawn. Our experts at BestYard.com studied what your municipality charges for water and storm service. Based on the information that we accumulated, we put together a worksheet that help you to calculate how much it can cost you to water your lawn during drought. There are some cutting-edge water saving programs, which use humectants to attract and capture free water molecules from the air. The water collected is converted into droplets, which are delivered to the root system of the lawn. To save water, always water your lawn in the morning when the evaporation rate is low. Water less in the shady area; instead focus on the dried and exposed parts of lawn. These simple strategies can help you save water and reduce your water bill, while taking care of your lawn. To get to know the cost of watering your lawn, you just need to type the amount of time that you water your lawn. The calculator will tell you total gallons of water used to run sprinklers, the average water and storm rate, per day and monthly cost of watering your lawn. The worksheet can help you plan when and how to water your lawn adequately, while keeping tab on cost. If you still find it difficult, BestYard.com can give more insight into water saving strategies by calling 720-851-7550. Click “DO IT FOR ME”to request a quote.